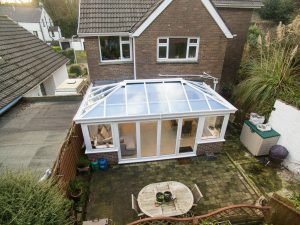 Do you need a conservatory roof, because you are extending your home in Surrey? Castle Conservatories has years of experience in helping customers in Surrey with their requirements. We proudly work alongside one of the most respected conservatory roof experts in the UK, to bring you tailored solutions designed with your home in mind. We can introduce you to a range of high-quality systems that will solve your home improvement dilemma – whether you’re replacing or building from scratch. Each of the conservatory roofs we offer can be bespoke designed by choosing from our range of high-value enhancements. If you want to try before you buy, visit our brand new Virtual Reality Tour. Effortlessly explore our wide conservatory roof range from the comfort of your home using your laptop or home PC – or while you’re on the move by visiting our website on your mobile phone or tablet. If you have a question about our conservatory roofs, want to book an appointment or request a quote, call Castle Conservatories today on 020 8669 1500 or send a message to info@castlecon.com for a fast response. If you’re looking for a replacement conservatory roof for your home in Surrey, here are just three of the versatile systems that we offer. 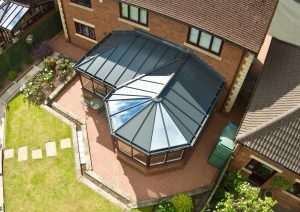 Each of the products can be used as replacement roofs, in the event that you need to update your conservatory, orangery or extension. Our portfolio includes a stylish-looking tiled conservatory roof that can be adapted to include a range of glazing choices. This stunning looking product can be tiled throughout if you want to enjoy absolute privacy, but you can also elect to have full-height glazing or ask our team to fit Velux windows instead in your replacement conservatory roof. You’ll be able to use light to great effect when you choose our tiled option, which is one of the more popular entries in our range. This incredibly lightweight conservatory roof is easy to move around and fit, too – which means we’ll be spending less time at your home in Surrey as a result. Because our tiled system places only minimal pressure on the frames and foundations of a conservatory, orangery or house extension, it is designed to meet the stringent requirements of building regulations and planning permission. At first glance, you might think that our solid conservatory roof is the same as our tiled offering. Both are hybrid systems that can accept the installation of glass – but there is one key difference that makes the solid option a viable buy in its own right. The solid system we sell is a conservatory roof that lets you choose the shape of your glazing. You can also ask us to place the glass wherever you like – so as to direct light where it’s needed the most and make the best aesthetic impact. Convert any area of your new room into a feature. Highlight a seating area or table so that it stands out and catches the attention of anyone who comes to visit – adding measurable market appeal to your home in Surrey at the same time. Our glass conservatory roof is a truly market-leading system that will flood your newly-built or renovated room with lots of space-creating light. This roof is stronger than any other comparable product available, as it has been tested to withstand winds of up to 130mph. Introduce your home in Surrey to your garden the stylish way by adding patio doors or bi-fold doors to your design plans. Wider spans can be achieved with this option, so you’ll be able to enjoy wide panoramas of the outside and cooling breezes. Customise your glass conservatory roof by selecting from our broad palette of colours. Our shades are available as painted or foiled aluminium and won’t lose their lustre when exposed to varying weather conditions over time. Contact us to find out more. Better Resale Value. If you are planning on selling your home in Surrey in the future, a brand new conservatory roof will restore your jaded structure to its former glory and provide you with an additional space. A Brand New Room. 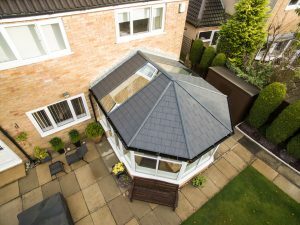 Once we have fitted your new conservatory roof, you’ll be able to use it for almost any purpose: a study, a play area, dining room or even a lounge. Almost anything is possible. Customisation Options. The Castle Conservatories team will help you enhance the appearance and performance of your conservatory. Why not improve thermal retention with stylish super-insulated columns! To ask us a question, arrange an appointment or request a conservatory roof quote for your Surrey project, call 020 8669 1500 or email us via info@castlecon.com. You can also discover the many exciting features of our conservatories, orangeries and extensions by visiting our Virtual Reality Tour app. Need a quote quickly? Use our design tool instead.